For me, Coachella is one of those events I look forward to year-round. When it finally arrives, it goes too fast, and when it’s over, it’s back to planning. I’m never not looking forward to Coachella and in my experience, it has gotten better and better each year I’ve gone. This is my fourth year but technically my third time inside the festival (the first year I only went to the parties). My initial plan for this year was to go weekend one for the parties and return weekend two for the festival; however, in a sick twist of events, my dear friends at Levi’s offered me a VIP pass to the festival, and well, you can’t just say no to that. 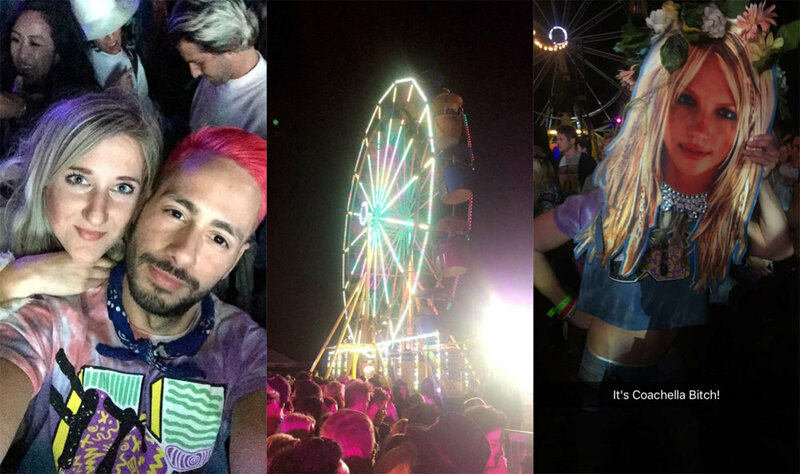 So for the first time–Coachella both weekends! Besame baby, besame mucho. Calvin Klein was my first party of the weekend. They threw the most epic rave party inside a massive warehouse with Alesso killing it on the ones-and-twos. All my favorite people were there (#bloggersreunion) and we danced the night away…in the most literal of ways. I couldn’t have asked for a better way to start the weekend and for better people to do it with. The following morning it was tequila bars with Levi’s and poolside hangs with Popsugar at one of my favorite hotels, Avalon Hotel Palm Springs. Both parties offered food, DJ sets, live performances (Jhené Aiko performed at Popsugar), and more photo booths than I can keep count of. A perfect oasis to decompress and rehydrate. Before any invites popped up in my inbox, this was literally the only reason I wanted to go weekend one. For anyone who doesn’t know, Neon Carnival is a giant fair (for adults, obviously) that takes place at an airport hangar in Palm Springs. It’s fully decked out…I mean bumper cars, games, cotton candy, a ferris wheel (duh), a Levi’s denim bar and a giant dance floor. This is the party to be. Ask Rihanna and Leonardo DiCaprio, they were there. Tired yet? Not even close. Next day, we hit up the Nylon brunch. And finally–the music–the reason we are all here, right? The lineup this year was straight out of a fantasy. My favorite performances include (but are certainly not limited to) Sia whose epic performance included a cameo by Kristen Wiig, Chvrches, James Bay, Alessia Cara, Calvin Harris with special guest Rihanna, Major Lazer, and Børns. In no specific order. I’m headed back to Coachella today! Catch all the action from weekend two LIVE on my Snapchat story. For now at least. Follow me on Instagram and get Reyal Fashion right in your inbox by signing up for my newsletter.